Achieve over 1300 REAL cfm of flow from your 4150 intake (and still use a 4150 bolt pattern) with only 1″ of spacer adapter required. 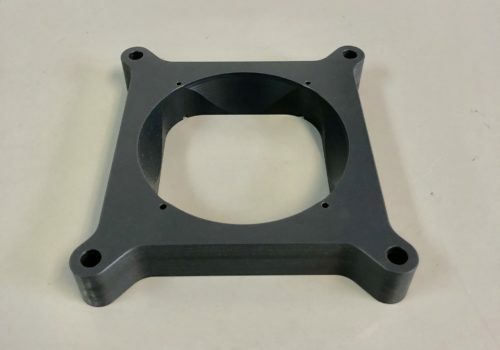 This 1″ spacer allows you to install the big 110mm SV1 on a 4150 intake manifold. To achieve this type of non-turbulent flow from a Dominator with a 4150 adapter would require 3 inches of distance! 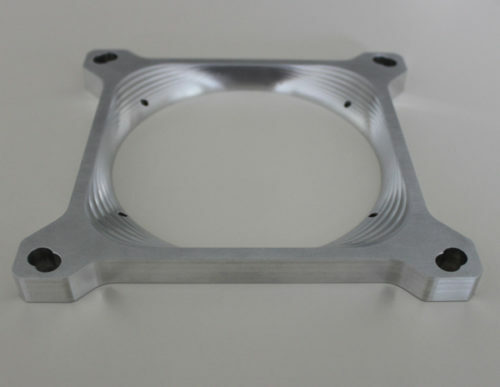 The SV1 with its unique one blade design will allow you install a big cfm SV1 and get non turbulent flow into your 4150 intake manifold in only one inch of space. We have done wide open throttle vacuum tests in intake manifolds and many times with adapters designed to install four barrel Dominators on 4150 intakes, the vacuum levels (vacuum load) at wide open throttle actually goes HIGHER when installing an adapter to fit this big Dominator in place of the smaller 4150. This effectively makes the new bigger carb smaller as air is lazy and only pulls from the central area of the four barrel carb and does not utilize the edges of the Dominator carb. So these Dominator to 4150 adapters many times show LESS or minimally increased power and will require the owner to then switch to a Dominator intake to fully utilize the increase in cfm the bigger carb offers. This is not so with the SV1, the SV1 with its centrally located air inlet (which requires minimal redirecting) along with this NEW adapter allows the transition to be smoother and gives the owner the new ability to install a big cfm SV1 carburetor on their 4150 intake and ACTUALLY show a big increase in cfm (reduced engine vacuum/drag) that will NOW show us a corresponding and expected increase in power. IN BACK TO BACK comparisons of SPACERS. 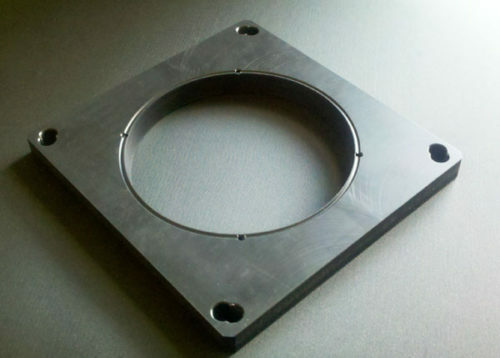 The Mach 1 versus a 2″ Dominator to 4150 adapter on 700-850 h.p. engines, we have consistently seen the Mach 1 spacer show gains of 8-15 h.p. over the spacers built to adapt Dominators to 4150 intakes versus the Mach 1 spacer. The Mach 1 is a great design that really works.